Russian Hill as seen from Telegraph Hill. Russian Hill as seen from downtown. Unfurling like ribbons from the ocean to the bay, they destroy our knees and wear out our break pads. By auto you can almost hear the familiar click-clack of a roller coaster car creeping to a crest before the big dive down the other side. By foot, they keep every promise of a beautiful vista. They are the Hills of the City. 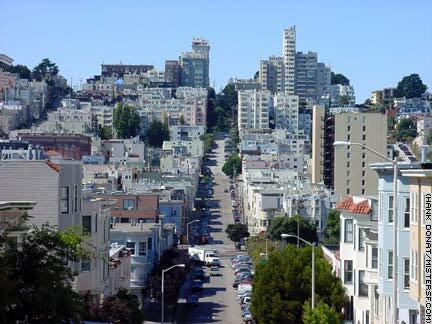 While Rome is famous for its seven, there are 43 named hills in San Francisco. A complete list follows. Click the image to reveal locator.